Our gold nanoparticles have narrow size distributions and no aggregation. Gold nanoparticles are one of the most commonly utilized nanomaterials due to their stability and optical properties. Gold nanopaticles are readily conjugated to antibodies and other proteins due to the affinity of sulfhydyl (-SH) groups for the gold surface, and gold-biomolecule conjugates have been widely incorporated into diagnostic applications, where their bright red color is used in home and point-of-care tests such as lateral flow assays. Gold nanomaterials can be conjugated to biomolecules to specifically target cancer cells, and used for photothermal cancer therapy, where their tunable optical properties cause them to convert laser light into heat and selectively kill cancerous cells. Gold nanoparticles have unique optical properties because they support surface plasmons. At specific wavelengths of light the surface plasmons are driven into resonance and strongly absorb or scatter incident light. This effect is so strong that it allows for individual nanoparticles as small as 30 nm in diameter to be imaged using a conventional dark field microscope. This strong coupling of metal nanostructures with light is the basis for the new field of plasmonics. Applications of plasmonic gold nanoparticles include biomedical labels, sensors, and detectors. The gold plasmon resonance is also the basis for enhanced spectroscopy techniques such as Surface Enhanced Raman Spectroscopy (SERS) and Surface Enhanced Fluoressence Spectroscopy which can be used to detect analytes with ultrahigh sensitivity. Each batch of gold nanoparticles is extensively characterized using techniques including transmission electron microscopy (TEM), dynamic light scattering (DLS), zeta potential, and UV-Visible spectroscopy. In addition to ensuring that every batch of nanoparticles meets our stringent quality control requirements, customers are provided with batch-specific specification sheets containing representative TEM images, sizing data, hydrodynamic diameter measurements, zeta potential analysis, UV-Visible spectrum, and solution pH. Surface chemistry and suspension buffer details are provided for each material, and no proprietary coatings or mystery chemicals are used. Gold nanoparticle products are available with a range of capping agents including citrate, tannic acid, polyvinylpyrrolidone (PVP), polyvinyl alcohol (PVA), silica, and amine-terminated silica. Gold nanoparticles are provided in two concentrations, NanoXact (0.05 mg/mL) and BioPure (1 mg/mL). 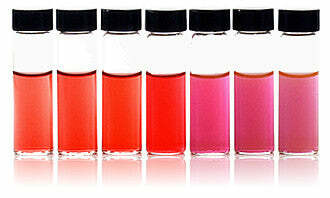 At NanoXact concentrations, the gold particles are a ruby red or yellow/red color in solution depending on their size. The BioPure formulation is 20X more concentrated and is red or red/yellow and opaque. The highly concentrated BioPure formulations are ideal for applications that require high concentrations or low residual reactants including nanotoxicology, environmental studies, and lateral flow assays. Even though the particles are made from a high density material, smaller gold nanoparticles remain suspended in solution. 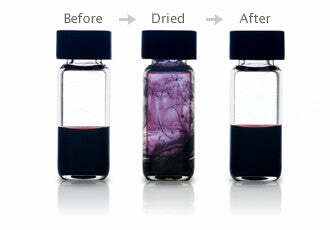 Large gold nanoparticles may settle out of solution, but are easily redispersed by simply shaking the storage vial. Due to their small size, low mass, and extremely high surface area:volume ratios, once nanoparticles bind together it is often impossible to separate them. Consequently, most dried gold nanopowders that are resuspended consist of clusters of 100's of individual nanoparticles. For many plasmonics and biomedical applications, this agglomeration significantly degrades performance. At nanoComposix we have developed custom processing techniques that allow us to concentrate and purify nanoparticles without inducing agglomeration. The particles can be transferred into a variety of different solvents to enable their integration into a wide variety of systems. In addition, we have developed a surface stabilization technique that allows us to produce dried gold nanoparticles that can be redispersed into individual, monodisperse nanoparticles. The following table links nanoparticle size with mass, atomic molarity, mass percent, particle concentration, and peak optical density for both NanoXact and BioPure gold formulations.